Pedestrian Liberation | Pedestrians reclaiming the city! Today (Thursday 5 Jan 2017) in Ipswich, and it’s only 10:30am. First off, I pass this vehicle on St John’s Hill in Ipswich. How can this possibly be not classed as obstruction? It is happens regularly here, and I have reported it to the police , but it still continues. A mins further on and I spot this van, car and wheelie bin making life for pedestrians very difficult on St Helen’s Street outside H & F Autos. Then onto Grimwade Street and the pavement next to a bus stop is completely blocked by this scaffolding lorry for the third day running. For sure, these guys need to unload safely and get a complex load of scaffolding installed, but do they need to bock the pavement like this? Are they allowed to? If so then should they have applied for permission? And have they done it safely and properly? In reality pedestrians walk past the sign rather than risking their lives crossing a busy fast one-way street at the suggested location. I spoke to the company and the MD told me that he believes that no permission is needed to do this. Checking some legislation, the ‘New Roads and Street Works Act 1991’ may be applicable. However, it says that one should not “create an obstruction in a street to a greater extent or for a longer period than is reasonably necessary, the street authority may by notice require him to take such reasonable steps as are specified in the notice to mitigate or discontinue the obstruction“. (section 66) which implies that they should have asked to permission. I will do some more digging. Pop round the corner onto Fore Street, opposite the university, and we find UPS well up on the pavement. Notice the ‘no waiting’ ticks on the pavement. I was pleased to see that today the scaffolders have replaced the ‘pedestrians cross the road’ sign with a ‘warning men working overhead’ which is much more appropriate. This shouldn’t happen. For sure, the G4S driver should not have parked in a way that treats pedestrians with such contempt, and the pedestrians who challenged her should be congratulated for performing their civic duty with calm and persistent determination. But… Why have G4S not taken steps to ensure that their staff don’t park like this? Where is the leadership from our politicians who are meant to create appropriate laws and empower the police to act? Where are the police – why are they not enforcing the weak laws that do exist? Please ask your parliamentary candidates what they intend to do about this epidemic of pavement parking, which only gets worse as the number of vehicles on our roads increases year by year. Do also pick up the conversation on this subject on our Facebook page. A quick poll. Do please response in the comments section below if you have either been splashed or nearly splashed by passing vehicles when walking. 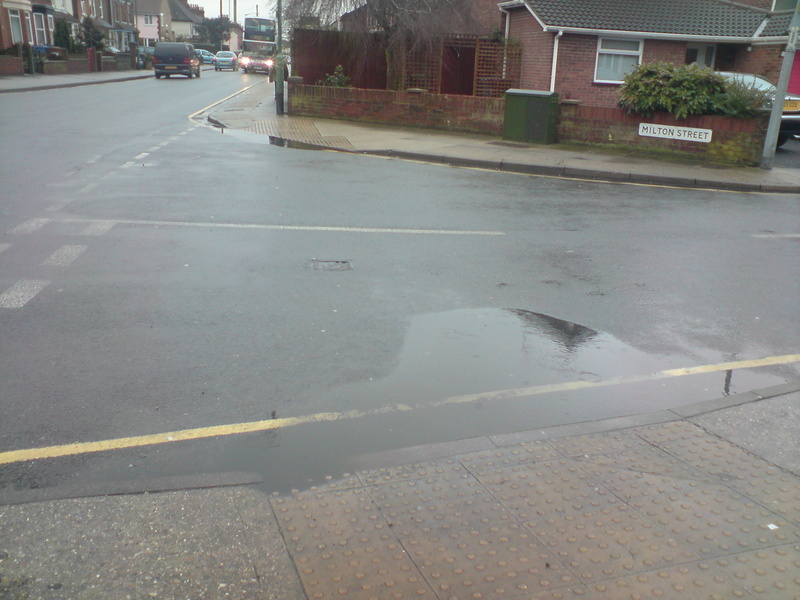 If you were splashed then did you think it was carelessness on the part of the motorist or possibly deliberate? I was very nearly caught recently when a motorist chose to keep going even though to do so would mean that he would drive straight through a puddle right where I was standing. And then this one. Here a large puddle (and a stupidly parked car to make matters worse) creating significant risk of a major soaking for pedestrians including the two who are approaching. Have you been splashed or nearly splashed by passing cars when walking? Do you think it was deliberate or carelessness? Also.. are there places where standing water on roads and the pavement makes it difficult for you to walk in wet weather? Check out ‘Think ahead, think Streets Ahead‘, an awareness raising video from Guide Dogs made by young NCS graduates in King’s Lynn. NCS describes itself as ‘a way for 15 to 17 year olds living in England and Northern Ireland to make extraordinary friendships, learn the skills they don’t teach you in class and create unforgettable memories.’ Well done and thank you, a great job. Do please keep at it! Driving on the pavement is banned by the same law that bans cyclists from riding on it. Needless to say, every car that is parked on the pavement was driven on it first, but that is another story. This post is about people to consider the pavement as a valid alternative to the carriageway when the road is blocked by a bin lorry, traffic or other obstructions. Many cars evidently do this to get past bin lorries on the Isle of White. Good to see the Hampshire Police at least highlighting the issue. And a whole line of vehicles using the pavement to get past roadworks in Swindon. 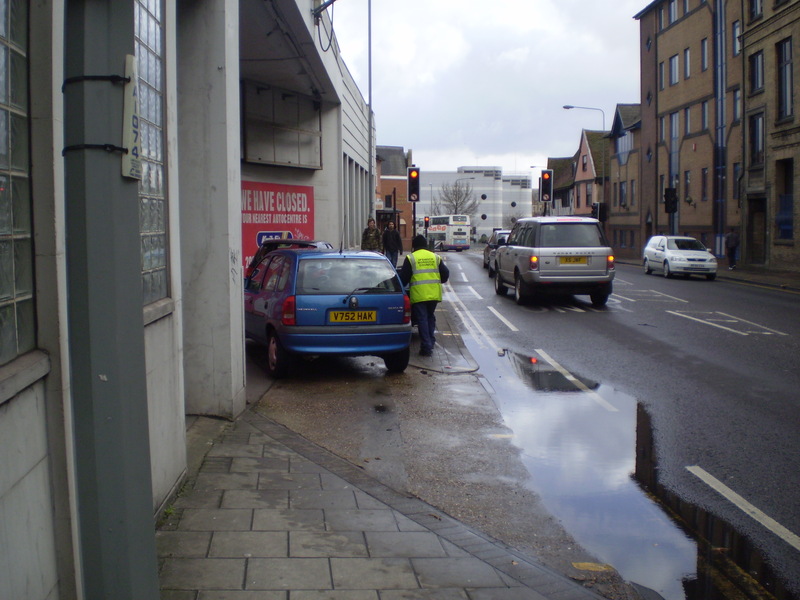 And in Bristol where a car is seen being driven along the pavement towards a pedestrian. 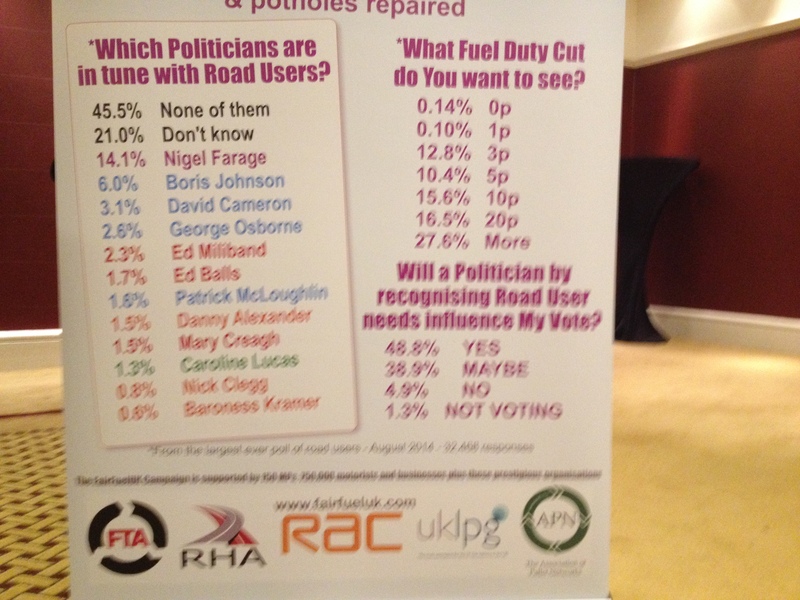 In this one the driver of a car in this one decides accelerates past a cyclist, with two wheels up on the pavement. Also report here of motorists driving on the pavement outside a primary school in Bolton and to get pass roadworks in West London. All of the above have been chosen to show what appear to be ordinary people driving on the pavement in ordinary circumstances, not whilst in a rage, drunk or when speeding or being chased by the police (which also happens). Is this issue a nationally significant one? Have you experienced it yourself? Do let us know in the comments field below. 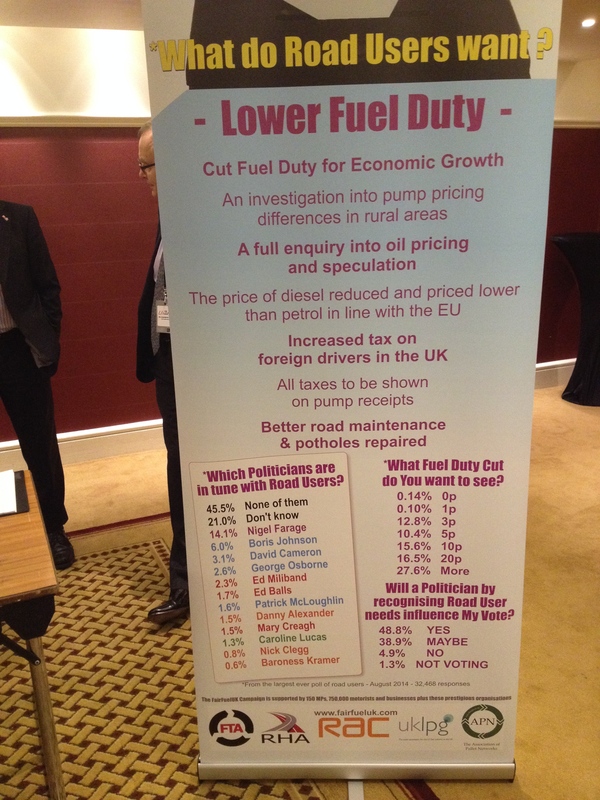 These banners, which were proudly displayed at a fringe event at the Labour Conference, give a clear impression that ‘Driver=Road User’ and ‘Road User=Driver’. This is totally unacceptable and marginalises all other road users. This is not an isolated instance, and we need to be challenge it. 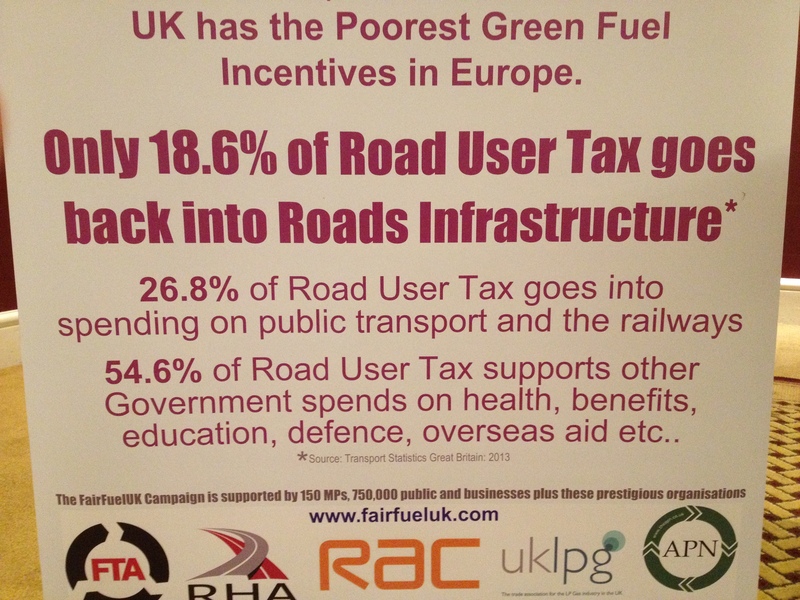 Following the success of the ipayroadtax.org campaign, I suggest we complain whenever we see the term being used in this way. 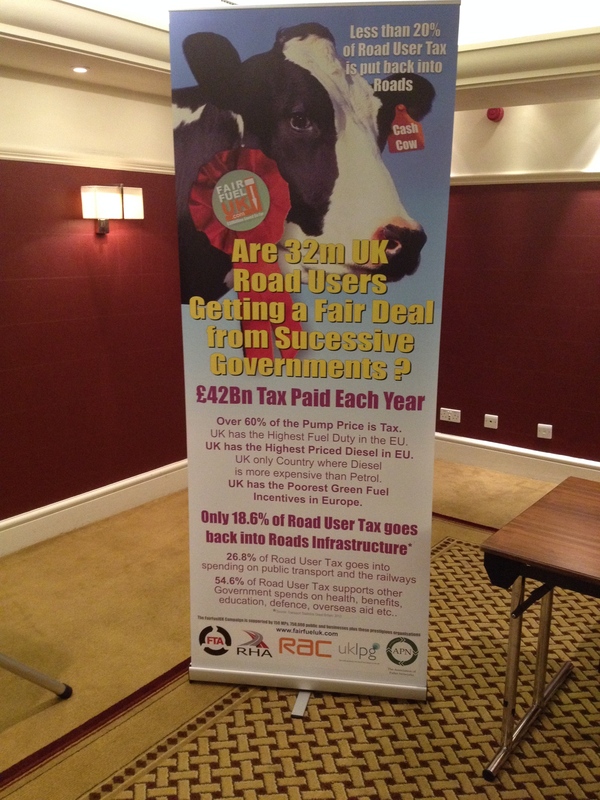 Here are the banners in question.